Every Realtor is bombarded by offers from companies that want to build your website and by companies who sell the tools for Realtors to make a website of their own. Deciding how to actually get a personal website can be overwhelming. Do you pay someone to make your website? If you want someone to make your website, how do you figure out who to use, how much to pay, and what you need? What a dilemma! 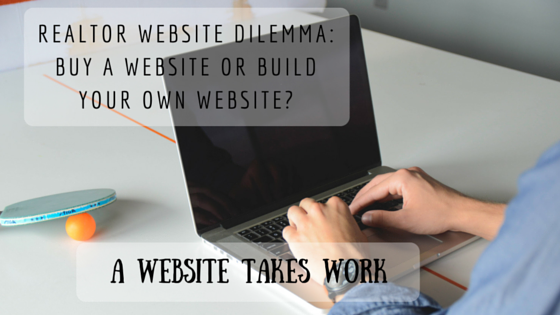 Or do you make your own website? Then the questions become how much do you actually need to know to build a website, what services are out there, and is it really as easy as they say it is? There are a lot of people and companies out there that build websites for any type of business. And they usually build really nice looking websites. They may even have a couple clients who are Realtors. In general, this type of website will cost several thousand dollars. You may have to find hosting yourself, or they can host it for you for a reasonable monthly fee. You will have to pay for IDX on your own. Just make sure these developers have really good experience with Realtor websites, because your needs are unique. View our recent post titled the 5 Elements Every Realtor Website Needs to ensure your website designer makes you a website specific for your real estate business. These companies have website templates for the websites they build. There are customizations, like logos, fonts, colors, images, content, and many other things to ensure your website is unique. The companies will either charge a more reasonable one time fee than the first two options (less than a thousand dollars), and charge a monthly fee (less than $200). Usually the fees include IDX and hosting, but sometimes you have to pay for those yourself. Check the fine print. And they sometimes offer additional services for additional costs. If you want someone to make your website for you, you should first determine your needs and how much you can spend. This will help you determine which of the four option classes you fit into. Then you need research companies, and compare them against each other. Why spend time researching? One reason is that you will be spending at least several hundred dollars up front in setup costs, unless you go for Option 4. Another reason is that you need to make sure it fits into your current business and marketing strategy, and your future strategies. You have probably heard the term “WordPress” if you have looked into getting a website. WordPress is the platform that most websites are being developed on. Why? Because it’s good; it has great built in SEO; it has great flexibility. Unfortunately, it also requires a certain level of technical expertise and time to learn it. But once you know how to use it with an intermediate level of technical expertise, you can create some amazing websites. You will still have costs with a WordPress website, like buying a domain name, IDX, hosting, a specialty theme if you want one, and some other additional utilities. You can build your own website from as little as $10/month (no IDX) to around $100/month. Agent Sidekick is built on WordPress. If you want to build your own website, and you don’t have time to learn WordPress, then we highly recommend an easier platform discussed in Option 2. However, WordPress is an open source platform, so people and companies have developed a lot of exceptionally useful tools that are compatible with WordPress and can be used on any WordPress website. These tools are not usually available for the platforms in Option 2, like Wix, Weebly, Squarespace, Jimdo, and others. You need to consider that if you plan to expand the functionality of your website, it might be difficult to transfer your website from an non-technical website from Option 2 to WordPress. Yes, these exist. You pay someone for the templates and tools, and then you build the website. These companies do fit a niche for some Realtors. These companies have created templates and website development tools on WordPress. They make it almost easy as Wix, Weebly, Squarespace, and Jimdo to build and customize your own website. There are huge benefits to this, in that the website will have all the customizations available on WordPress, the speed of WordPress, and will definitely integrate with IDX. The drawback is that they will cost almost as much as (or more than!) companies developing semi-custom websites for you, and you have to do the work yourself. You may also need to pay additional for IDX and hosting. One thought is that you are a Realtor, not a website developer. Do you think that you can build a website that is to your quality standards? Another thought is that your time is better spent on your business, not building a website. Consider it will take months to learn WordPress, plus months after that to build your website, plus many hours per month to maintain it. That time would take you away from your real estate business.